We went to bed last night as the snow was falling and woke up to about 2-3 inches! I think I'd better get out and fill up the bird feeders! Here is a view to the southwest from our back door. And here is a view to the East. Mr. Squash is out shoveling the driveway and sidewalk. Earlier we saw a group of neighbor women head out with snow shovels in hand to help some of the other neighbors! I know they walk together, so I'm sure this is a great alternative for walking today as well as doing a good deed! And what else is one to do when you're retired and it's snows? Well, if it isn't quilting, then it must be baking Finnish Gingerbread! Here is a nice plate of Ulla's recipe made with the cookie cutter she gave us! I hope everyone had as nice a Christmas as Mr. Squash and I did! Between packing to move, unpacking here, painting, arranging and working on getting things the way we wanted, we decided we were too pooped to get a tree, but we had each other and Miss Sophie and that was all we needed! Dinner was a small prime rib, Alice Water's Brussels Sprouts with Bacon and baked potatoes. We watched Juie and Julia after dinner and had a wonderful day! The other day a package arrived from Ulla. This is how it looked on the doorstep! Mr. Squash said it must have fallen off the sleigh several times! Fortunately, everything was there --- the only thing that went awry was Ulla's beautiful wrapping job. We repositioned one of the ribbons for the photo and quickly unwrapped the goodies! If you enlarge the photo you can see the wonderful Finnish card - we really love it! Inside were so many thoughtful gifts - our enormous thanks to Ulla and Mr. K!!! Below you will see a package of Linden Tea...Mr. Squash had mentioned through one of my emails to Ulla that he thought a tree in a photo of hers was a Linden tree and that he had tasted Linden tea many years ago! We haven't seen it here, so Ulla sent him some! It's absolutely delicious! The long package next to the tea is a chocolate/gingerbread bar - wow - yum is all we can say! She also included her recipe for Finnish Gingerbread and a cookie cutter for it - I've already made up the dough - just waiting for it to chill for tomorrow's baking! Ulla also made a gorgeous thimble holder (with thimble included), scissor holder and scissors included, pin cushion and a fantastic needle older complete with various needle sizes!!! And another package came from Nanette - a "random act of Christmas Cheer"! What a lovely thought, Nanette - thank you so much! There are numerous squares of some of her fantastic fabric finds - if you've been reading Nanette's blog, you know that she is has so many wonderful fabrics in her stash!! I already have an idea of what I will do with these!! I finished painting my studio on Thursday - a light tan color which doesn't at all show in this photo. It took 2 coats and about 5 days in all, but it feels so much better in here with the blue walls covered! I managed to hang my favorite quilt, so I thought I would give you a sneek peak! I've had that oak quilt hangar for years but never been able to put it to use! After a "measuring mishap" I was happy to finally get it on the wall! On top of the 56 Drawer chest is Mary's little quilt she sent a while back, and Kaaren's painted lamp that I won from her earlier this year. Slowly but surely, the studio is taking shape! We have SO much left to do, but are enjoying every minute! Tomorrow I'm going to finish painting the window trim in the kitchen and apply a test coat of paint to the walls. Figuring out the wall color for the kitchen has been a real dilemma, but I think I'm getting close! I'm also trying to get back to reading everyone's posts on a regular basis - I read them all Christmas Day and realized how much I missed keeping up! 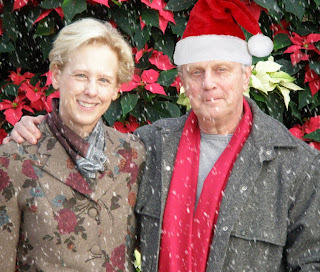 A Very, Merry Squash House Christmas to All!! I know I've been absent of late! The days go by so fast. This past several days we've been taking care of a lot of small projects - and some large ones, too! Today I welcomed over a window coverings professional. We hit it off right away, having many things in common. She helped me pick out woven wood shades for the master bedroom, a similar style for the guest room - only they are synthetic, and my studio is going to be a big surprise! I'll meet with her again tomorrow to find out how much this will all cost - and see if any "adjustments" need to be made! The room that bugs me the most and I think needs attention first is my studio! It used to be room to two darling little boys. It's painted a light blue with planetary, dark blue shades! My brain freezes every time I walk in here - the colors are just not me - I can't even think in here! So I picked up some paint samples and chips today. Obviously these won't come over the internet looking anything like what they really are! I painted a 2 x 2 foot area of Cocoa Butter on one wall a while ago, and will do a second coat in a bit. It's pretty, but may have too much peach in it...stay tuned! I also received a package from another special friend, Carrie! She sent the nicest card, a box of wonderful Moravian sugar cookies, which were quickly consumed in a couple of days, a handmade towel for the kitchen (even the trim is hand stitched by Carrie), a handmade ornament, and a charm pack of one of my favorite lines, Nature's Chorus! The charm pack was wrapped with a really neat tag and a vintage spool of thread. I told Carrie I was even going to use the tag as an ornament! Thanks again, Carrie! We have so much left to do, but are settling in well! We love the town, the people, the weather, and of course our Squash House! Hall coat closer after. I found these brass light pulls at Home Depot yesterday - we have three lighted closets in the house. They're so much nicer than the string that you see in the first photo! Now I just need to neaten up the hangers - switch those plastic ones for more wood hangers that I know are still in a box somewhere! Yesterday and the day before I worked some more trying to set up my studio. For now it just isn't working for me. I have an idea of what might, then I also remembered I bought this book a while back. Lois lives near our former house. I sure wish I could simply invite her to spend the weekend over here and help me in person! She offers consultation over the phone/internet and I may just take her up on it! We are thoroughly enjoying our first nearly 2 weeks of retirement! One thing I've noticed is that we aren't spending nearly as much on groceries as we did while working! It seems we eat everything we buy so far, including leftovers! Today is another run to the landfill with a few more things from when the house was updated along with another run to the recycle station with more cardboard boxes and paper! We have several inches of new snow on the ground and another storm with several more inches predicted for tonight --- yipppeee! Actually, I am where I'd like to be - The Squash House, but at the moment, I'd like to be sitting in one of these luscious leather chairs! They were delivered yesterday - loads of creamy Italian leather! We splurged on them as a retirement treat! Mr. Squash and I sat in almost every chair/ottman combination until we found these. I particularly like them because the arm is low enough for me to embroider, hand quilt, or sew on bindings!! The lower level will be our family room where we intend to spend a lot of quality winter time in front of our new flat panel TV! Tomorrow we're going to pick up a fun rug to put under the chairs. Now...here's the hard part...finding time to actually sit in them and watch TV! We are both exhausted from nonstop unpacking! I tweaked my back when the movers were here. Everything I do now takes extra effort and lots of extra time to accomplish. I certainly had a lot of sympathy for Mr. Squash when his back was out this summer/fall, now I have even more! In two days, however, we are quite far along in the unpacking process! All that is left is the living room, my studio and the garage. It doesn't seem like much, but between my studio and the garage I think we have several days worth ahead. On Wednesday while waiting for Mr. Squash to arrive, I spied a box marked "Father Christmas" among other things. I thought, why not get him out to signal in a little Christmas spirit! He was one of the Christmas In July exchange gifts from Melanie. I realize he looks a little lonesome...hopefully he'll have some company by next week! I sure have appreciated all of you kind words on retirement and finally "coming home"! I try to sit down an hour or so before bedtime and go through email. Monday the cable installer comes - it will be nice to have regular internet service instead of "borrowing" off whichever neighbor has the unsecured wireless connection! Just a quick post to let you know that Sophie and I arrived safely at the Squash House yesterday! Buying the "castle" was genius! For the most part she sat in her bed in the castle and watched the treetops race by. Going over Snoqualmie Pass she cried a bit, but I think it was because of the altitude difference - her ears may have been popping! Other than that, I didn't hear a peep out of her! She would not come out of the castle or even allow me to pick her up out of her bed after we arrived. So I carried her in her bed to the guest room, set up water, food and litter and left her alone. I was exhausted and went to bed around 7:30 - which of course was the time she decided to be adventurous! After a couple of hours of jumping up and down on the bed and venturing in and out of the room for brief periods, she finally settled down under the covers next to me! Here she is below this morning - still under the top comforter! I pulled it back to offer her a couple of treats and get a photo, but she was quickly back under! When I first walked into the house I was greeted by this enormous Poinsettia and a three-tiered package of cookie treats! It was from our neighbors across the street - Andrea, Ted and Justin - as a welcome to the Squash House gift! How nice of them! Mr. Squash is on his way over and should arrive around mid-afternoon. He will be a sight for sore eyes! The movers arrive tomorrow morning at 8:00 a.m., which means a very busy day ahead. Today I'm unpacking boxes that we brought over prior to listing the house (you can see part of the mess behind the poinsettia) and our friend Carol is bringing pot roast for dinner! Life is good! I hope everyone had a wonderful Thanksgiving! Mr. Squash and I went out this year being that we're moving on Tuesday! We went to the Salish Lodge at Snoqualmie Falls. Oh -- My! We wish we'd tried this years ago! What a wonderful dinner we had in a historic setting! It was a prix-fixe dinner, which was fine with us. On the 1.5 hour drive to the lodge we discussed the only thing we thought we would miss would be leftovers! Well....we didn't have to worry about it after all! A very nice waiter carved a small turkey at our table and as soon as he was done, he said we would be taking the rest of the bird home with us!! Below is a picture of the menu, a dragonfly tree ornament I bought in the gift shop and the rest of the turkey nicely wrapped up in foil! When we got home, we put the large bag the turkey was in on the floor for Sophie to play with. She loves paper bags ... don't all cats? Here she is looking rather smug inside the bag - daring us to come near. I think one reason she dove right in was the smell of the turkey! I took Sophie to the vet last earlier this week for a final check and to see about some sort of sedative for the long drive to the Squash House. Unfortunately the vet detected a rather pronounced heart murmur, which means it isn't safe to give her any kind of sedative. Sophie does not like car rides, either! So he suggested we invest in a larger carrier to help make the trip a bit more comfortable for her. I went to the pet store this morning and came back with this wonderful soft-sided castle! The sides zip up and down and even the roof has a zippered opening! It fits her lambskin Orvis bed and it you turn it sideways, a small litter box as well! I set it up when I got home, put the bed in and rubbed catnip all over it. She's been in and out, but so far is sleeping on her other bed nearby! Hopefully she'll at least get familiar with it before we leave! I hope to have one more post before leaving on Tuesday morning. That's my plan, but it may not happen. If for any reason you don't hear from me either in a post or email, it probably means we've turned off our computers here, only to appear on "the other side" shortly! Better yet ... What's my name, where am I? What a week! We packed, packed, and oh, did I mention we packed? I thought there was so little left to do as the weekend approached. Then Saturday we started on the garage! Years ago we had custom cabinets built for our fly fishing and camping equipment. It has always been well organized, but we decided we needed to go through a lot of the stuff we haven't used for a while. Then there was all the gardening stuff, and Mr. Squash's workbench full of tools and computer equipment. Whew! By the end of yesterday we finally finished! It was a good feeling, but oh, so tiring! All that is left now is a portion of the kitchen, both full baths (minimal), and odds and ends. Tomorrow morning Mr. Squash is having cataract surgery on one eye. We wanted to finish the bulk of the packing so we could concentrate on this, and we did! I go back to work in the afternoon for more training of my replacement, have Thursday and Friday off, then a partial day (I hope) on Monday - my last day! Tuesday I take off for the Squash House with Sophie. Mr. Squash stays behind to be here while the movers load up, then he joins me on Wednesday. Believe it or not, up until last week I've been working on a little Fall stitchery in the evenings. I got this from Karen at Farmhouse Woolens. Instead of using the darker muslin that came with it, I'm using a distressed muslin that I got from the Fat Quarter Shop. I apologize that it isn't ironed! I word normally photograph a project fully ironed and neat for viewing, but the iron is packed! The sun, moon, scarecrow hat and leaves will all be wool! I think I'll make it into a pillow. It's adorable! I'll be sure to show you the finished project, which at this point will probably be early next year! I hope to have another post or two before we leave. I dearly miss keeping up with all of you, but it won't be much longer until life returns to normal! I always enjoyed the British series Upstairs, Downstairs. Now Mr. Squash and I are going through our own "version"! We did some really serious packing this weekend. Saturday Mr. Squash took down all of the art in the house, dusted the backs, cleaned the glass and stacked them up. Quite a bit is already at the Squash House, this is what we left while the house was on the market. Here are the larger pictures stacked upstairs. I've already packed up the smaller pictures - the movers can do these. And here is what is stacked up in the living room! We've enjoyed collecting a lot of art over the years - this house has an amazing amount of wall space for all kinds of hanging pictures. The sad thing is that the Squash House does not have as much wall space. A lot of this and what is already there will have to go. We had a huge garage sale last summer and now realize we need to have another after we unpack and the weather warms up! One thing that has just amazed me as I've emptied closets is how dusty they get! We keeps our closets fairly tidy and neat, but upon pulling things out to pack, I was amazed at how much dust I encountered - ack! I think I'll now make it a rule to empty out closets completely on a rotating basis to keep the dust from building up so much! I am largely absent from blogland other than to tend to my email. It will just "have to be" until all of this is over. This week I begin training my replacement at work - she's terrific. There is also going to be an office lunch for me on Tuesday. I can't believe what everyone has already done for me...the going away presents have been awesome and very unexpected! Lucky Friday the 13th Winner! Who said Friday the 13th is and unlucky day? 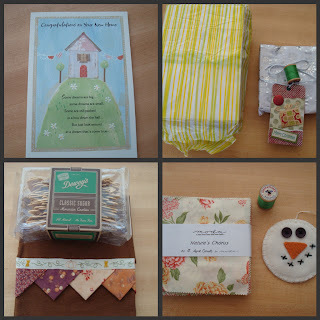 Jackie over at Jackie's Stitches is the lucky winner of my What Is It contest and Rouenneries Giveaway! Congratulations, Jackie! While she didn't quite guess the right answer, many of you did! I love how creative you all were with your guesses! I think my favorite one was that it might be a clock pendulum! Here is "what it is" below - a toilet flusher handle!! We have a half bath in our home that we devote entirely to fly fishing! I have collected all sorts of vintage and new fly fishing and outdoor themed items for this small bathroom! It was orginially Mr. Squash's idea - I took it and ran! We've had a lot of fun with it and I can't wait to get the bathroom at the Squash House painted and decorated! There is only one problem with this new little trinket - it doesn't fit the toilet in the fishing bathroom at the Squash House! I was so disappointed when I went to install it - that one and the one in the master bath have side flushers! The only one in the house that would accept it is in the lower level bathroom! Oh well, at least it fits somewhere in the house! The rest of our time until we move will be devoted to more packing and training my replacement at work! We finally had the appraisal on our house and will be closing sometime between the 20th and 25th! Moving day for me and Sophie the wonder cat is December 1st. Mr. Squash will stay behind to greet the movers on Dec 1st and join me and Sophie the next day! Not long now! What Is It Contest and Giveaway! I made it back safe and sound from my overnight quick-trip to the Squash House! It got a little dicey over the pass coming back - lots of snow - but I made it just fine! The next trip over will be with our little cat, Sophie, and it will be home sweet home! To celebrate our impending move, I thought a contest and giveaway was in order! Everyone loves the new Moda line from the French General - Rouenneries! This charm pack and jelly roll is from the new quilt shop, Stash, near the Squash House! In order to be eligible to win these great items (and you know me - that's not all that will be included) you just have to guess what the thinga-ma-jig is below! Here's a hint: it goes in one room of our house that is totally devoted to fly fishing. I found it recently at a local gift shop and just had to have it! Don't worry - after the contest ends, I will show it to you in it's proper spot! Here is a close-up of the trout portion - all hand made in pewter! Please remember when leaving your guess that I must have a way of contacting you should you win! If you are commenting anonymously or as "noreply-comment", please leave me your email address otherwise you will NOT be entered in the drawing. You won't get extra chances by following or posting this on your blog - just leave one comment here - I'll enter all comments - correct guess or not! Contest ends this Thursday, November 12th at 5:00 p.m! Hey - if you win - you won't be able to say Friday the 13th is unlucky!! I'll leave you today with a photo of the kitchen table we decided to get for the Squash House. This one was a much better fit than the rectangular table I showed you here. We picked it up this weekend so this photo was taken as it sits in our garage! I just love the quarter-sawn oak and I found chairs at Pottery Barn that are a perfect match! Have Berninas & Fly Rods - Will Travel! Wonder where I've been? Most of you know I was really busy this past week with the interviews for my replacement at work - as well as getting ready for our move to the Squash House! What a week it was! Out of 81 excellent candidates for my replacement, the one I really wanted got the job! If you're reading this Shelly, congratulations! Not only is she perfect for the job, she knows the work, having come from inside the organization, so the transition will be easy, peasy! Now that is a huge load of stress off me! The other great thing that happened was the appraisal - finally - after weeks of wondering when it was going to happen! Now we can seriously pack! I am posting this from the Squash House. Mr. Squash stayed home and I came over just for the night to deliver my 3 Bernina's and our precious fly rods. While we have a fantastic moving company, we wanted to bring these prized possessions over ourselves! Here is what the back of my car looked like at 7:30 this morning! You can see two of my sewing machines on the left (one in the blue carrier) and the other is under the Ricoh box! My Pilot was packed to the hilt with the rest of my studio contents (mostly boxes of fabric), but there was room behind the front seats for the fly rods! I'm so sorry I haven't been able to visit many blogs this past week. If all goes well next week, I'll have some time in the afternoons to catch up, but I have a feeling from now until December 1st my life is going to be crazy! I am keeping up with email right now, but that's about all I've been able to handle! Check back again in 2-3 days - I'm going to have a giveaway! It's going to be a fun one, so come back soon! 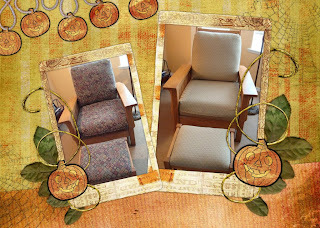 We got some of our re-upholstery back this week. I was very glad to get at least the cushions and ottoman for my chair so I could have it for the weekend! Monday they will be picking up the chair and sofa to do the upholstery on the underside, but I'll have something to sit in this weekend - thank goodness! I promised you I would show a before and after. I made this fun collage using Picnik - my favorite photo enhancing program! I've mentioned this program before - and each time I use it I find they've added fun new features! So the chair before was a great, colorful fabric, but it had faded considerably over the years from the sun. I thought about going with another colorful fabric, but decided to do something neutral so I can have more decorating options for the rest of the room. I especially want to be able to display quilts for different seasons, and I didn't want the upholstery to compete with the quilts! Below is a close-up of the ottoman which gives you a little better idea of the delicate pattern in the fabric. Work last week was very interesting. In addition to being busier than I could ever imagine, I was in charge of taking in all the applications to replace me! We only advertised for less than a week because of the timeline for getting someone hired. Nevertheless, we took in 81 applications which were weeded down to 12 for final interviews next Wednesday. Personally, I hope one of the three within our organization who applied get hired, but there are a lot of good candidates. So many that applied we jobless because of the economy and from what I heard the past couple of days from those that were calling references, not enough good things could be said about all of them! It will be a tough decision for the interview committee, of which I am not a part (and glad of it). There will be some more packing this weekend, but as yet we have not had the assessment, so we have to be careful what we pack and where we put it! Of course we'll be delighted to see the trick or treaters this evening! I hope you all have a fun and safe Halloween! This weekend Mr. Squash and I were out and about. We didn't work too hard packing - the appraisal hasn't happened yet, so we've done what we can until that is over. Sunday we decided to wander around the antique shops in Snohomish. We're looking for a couple of additional pieces for the Squash House. This poor witch seemed to have gotten herself into a bit of trouble! I think the enormous spider sitting on her feet might have had something to do with it! Aren't these pumpkins great? I love the gnarly warts growing on them! Look at this box of apples freshly picked from the orchard - my favorites - Honey Crisp!! I wish I had room to take the entire orchard box home with me! One of the furniture pieces we're looking for is a small table for the kitchen. I really liked this one - if you enlarge the photo by clicking on it, you will see another layer of table under the top. You pull on either end of that lower layer which pops out and up to make the table longer! This was American made, circa 1920, quarter sawn oak. I saw another table, same era and wood that was round. I wish I had taken a photo of it - I think that's the one we'll get. We had a really nice day with absolutely no obligations! There won't be many more of those, however! I think we have our work cut out for us right up to closing on November 30th! Since we're busy packing for our December 1st move to the Squash House, you obviously aren't going to see much in the way of quilting posts for a while. Instead, the "Life" part of my blog subtitle will be taking over for a while. I always have my little camera with me, so I thought today would be a good day to take photos while on my noon walk - and a very splendid noon walk it was in Fall's full glory! Acer Palmatum below. For more of these gorgeous trees, check out Stephanie's blog today! A very friendly dog called Bailey lives here and is usually napping under this incredible tree when I walk by. Our town is filled with wonderful old, stately trees! I love this oak leaf mixed in with fallen ornamental cherry tree leaves. Isn't this an incredible pair! Check out the leaf potpurri below! I love this homeowner 's display on her front porch! Do you believe these crabapples? I don't think I've ever seen such a healthy and full display! You can get an idea of how enormous this maple tree is by the size of the porch below - the house itself is quite large! I hope you enjoyed walking with me today! Kim is also looking for people to join in on her walks - stop by for a visit!